Walkers Christmas crisps selection bags this year contains three flavours firstly there is the expected Turkey and Stuffing, which I will undoubtedly be writing about shortly. This is the most obvious seasonal flavour. Secondly there is Brussels Sprouts flavour (oh yes and they are tinged green) Spectre wrote about these, and did not get on with them. I liked them if that counts, but they do taste of sprouts! Finally we have these new Walkers Pigs in Blanket flavour crisps, which everyone knows is the best part of Christmas dinner. 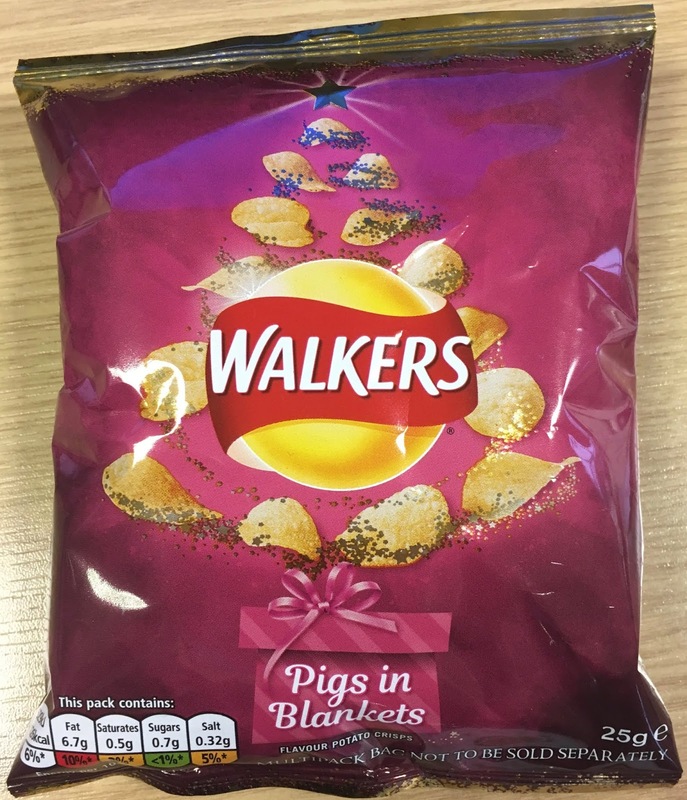 I opened up the seasonal bag and the crisps smelt very much of bacon, in fact just like Walkers regular smokey bacon crisps. I gave them a try and the predominant flavour was indeed bacon, with a good hit of smoke, but there was also a nice flavour of herbs and spices, I think I picked up on sage, which represents the seasoned sausage element of pigs in blankets. These crisps defiantly focus on the bacon flavour, but the addition of the herbs is a nice touch, and it does work well. I thoroughly enjoyed these crisps, and look forward to eating more of them. They are certainly more easy going the the Walkers Brussel Sprouts edition, but full marks to Walkers for an excellent selection bag this year.